From center: Kristina Feng and Hailey Wong’s routine at nationals earn them Gold medals. 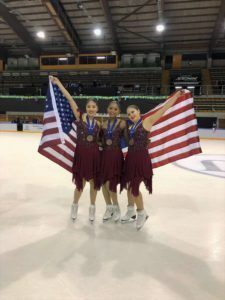 Three Great Neck Skyliners won national championships in Plymouth, MI, during three days of intense competition at the 2019 U.S. Synchronized Skating Championships. 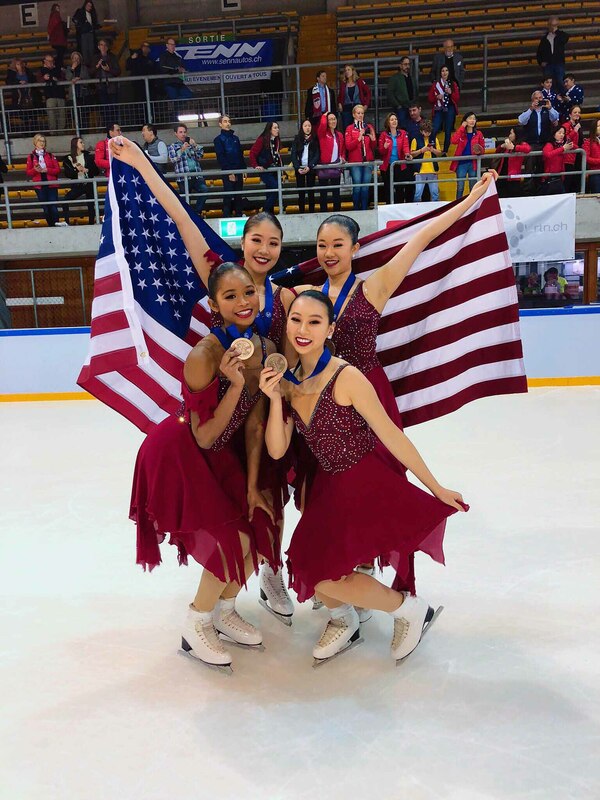 The Junior team went on to win the bronze medal at the ISU World Junior Synchronized Skating Championships 2019 in Neuchâtel, Switzerland, on March 15 and 16, making history as the first U.S. 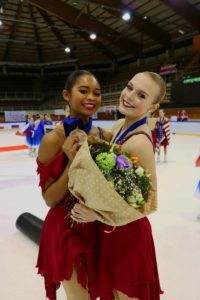 Junior team to win back-to-back medals with their bronze in 2019 and the first-ever medal for Team USA last year, capturing silver in Zagreb, Croatia. 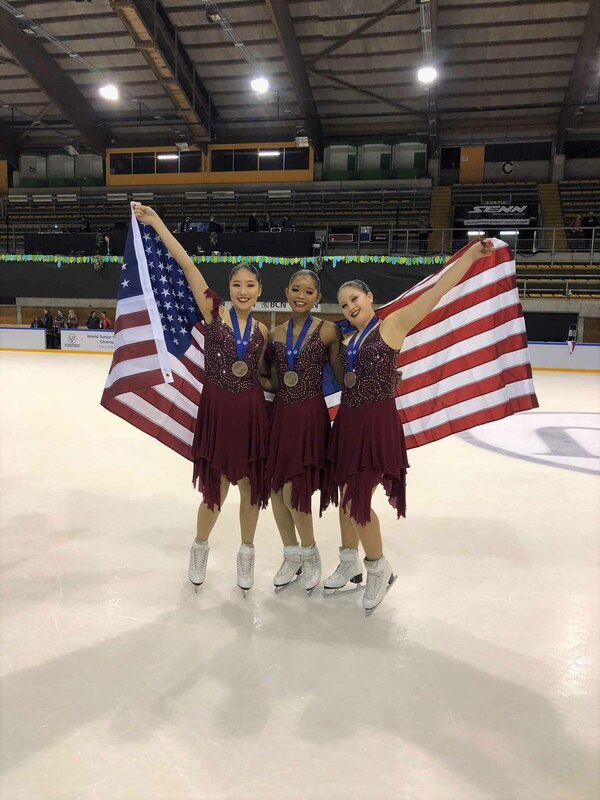 From left: Tracy Wang, Amie Adjakple and Alyssa Politoski win Bronze in Neuchatel, Switzerland. Amie Adjakple, a 16 year old in 11th grade at Great Neck North High School, became a gold medalist with her Junior line team at nationals and won a bronze medal at the world competition, along with teammates Alyssa Politoski and Tracy Wang of Manhasset, who have been members of Great Neck Figure Skating Club, training at the Andrew Stergiopoulos Ice Rink in the Parkwood Sports Complex in Great Neck since they started skating. 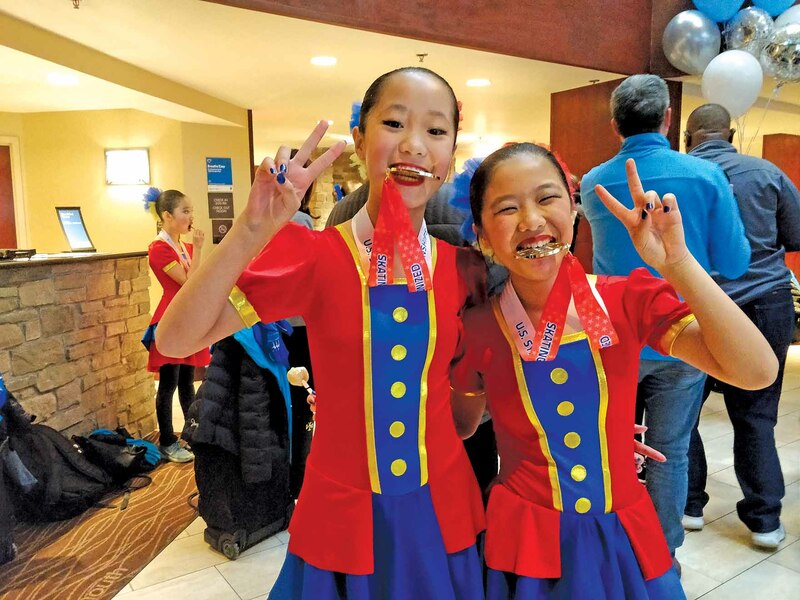 From left: Hailey Wong and Kristina Feng get a taste of gold at nationals. As part of the Skyliner Juvenile team, Kristina Feng and Hailey Wong, both 12 years old and in seventh grade at Great Neck North Middle School, also became gold medalists at nationals. The dedicated skaters have worked incredibly hard for their medals. The Juveniles become champions at nationals. 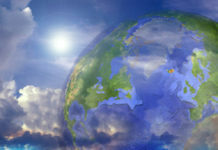 During synchronized skating performances, 12 to 20 athletes skate to music in unison, moving as one flowing unit at high speeds. Each member must possess speed, footwork and presence. 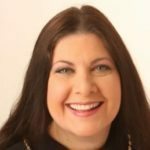 The Skyliners Synchronized Skating Team was established in 2001 by a group of parents who wanted to create the most competitive synchronized skating club in the tristate area. 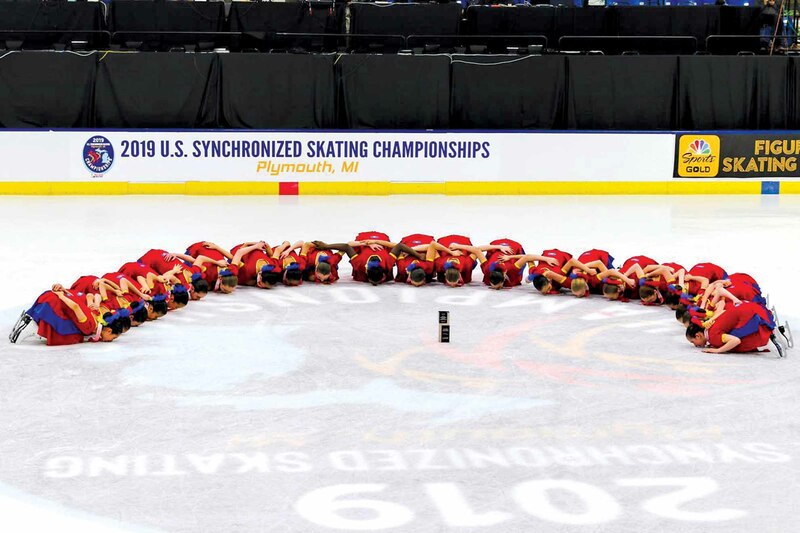 It began with three lines and has grown into one of the top synchronized skating teams in the country with 16 competitive lines and 270 skaters ranging in age from 5 to 26. The Juvenile national champions kiss the ice. The team’s 2018-19 season culminated with a total of five national medals. 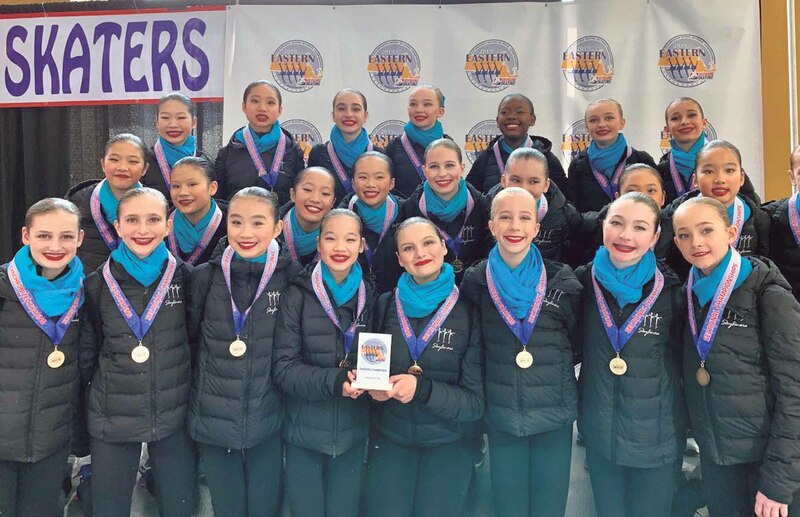 Three Skyliners qualifying lines—Junior, Novice and Juvenile—won national championship gold medals, the Intermediate line won bronze and the Senior line won silver. The Juveniles surround their proud coach. 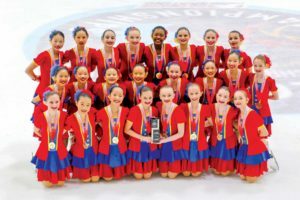 Nationals brought together the best teams at the USA Hockey Arena, and, by March 2, the Skyliners skaters proved their technical and artistic prowess across every division. 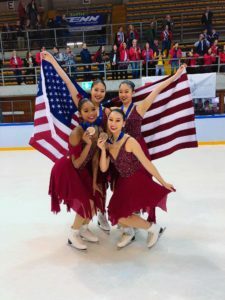 The Skyliners Senior line thrilled the standing-room-only crowd with its top-scoring short program set to “What a Wonderful World,” and a dramatic free skate to “Turandot,” which sealed a silver medal at 218.14 total points. 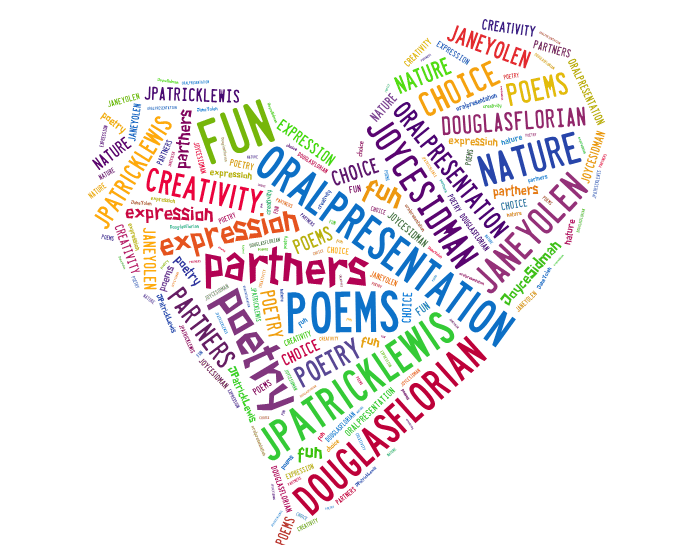 The Juvenile team wins Gold medals at the Eastern competition. Junior took home its third-consecutive national championship title with a season high of 202.48 total points for the elegant short program “Who Wants to Live Forever” and dazzling “Carmen” free skate. Members of the Juvenile team celebrate their Gold medals. 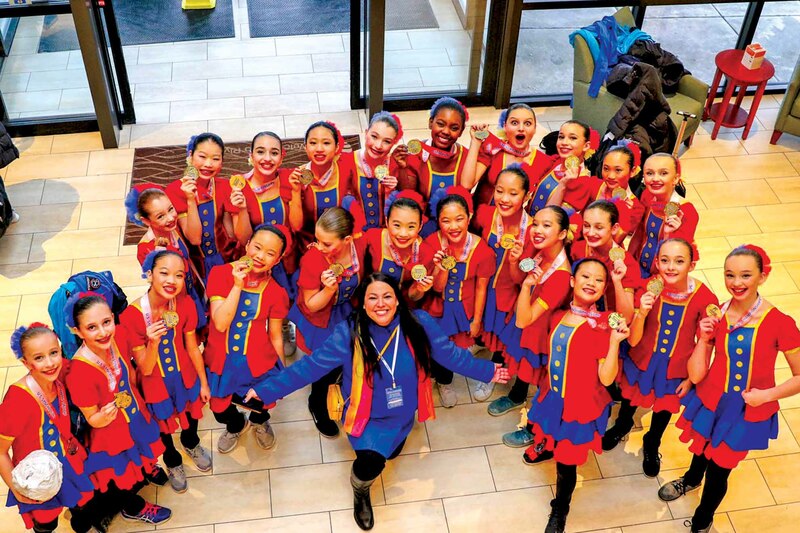 Skyliners Novice captured its third-consecutive national champion­ship title with its standout “The Greatest Showman” program, scoring a season’s best 76.13 points. Intermediate locked in the bronze medal with its “Go-Getter” program, earning a 66.17. Out of 12 teams from across the country, Juvenile captured its national title with an entertaining “Circus” program, scoring a season high of 61.94 points, 4.5 points higher than the second-place team. Amie Adjakple (left) and her teammates celebrate their Bronze win in Neuchatel, Switzerland. The Skyliners Junior and Senior lines—each Team USA designees—were both selected to represent the U.S. at the world championship events. 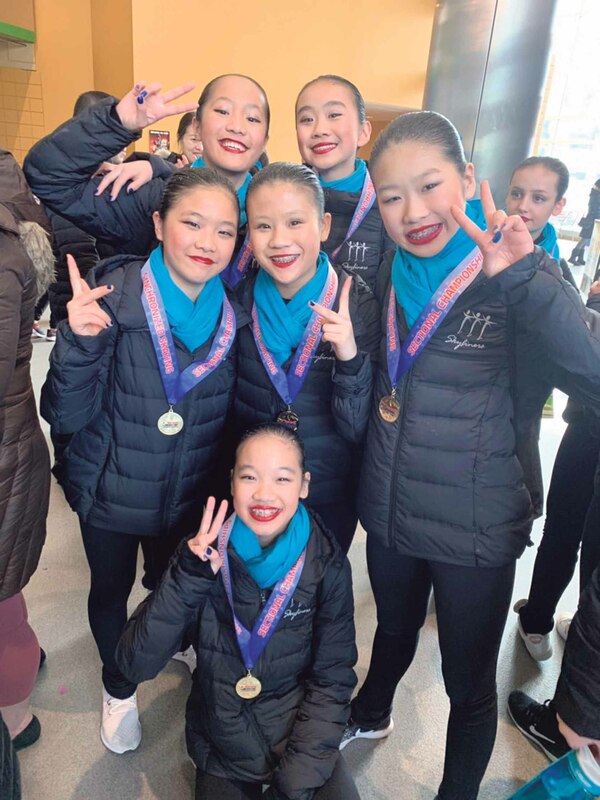 The Skyliners earned their place at nationals after taking the 2019 Eastern Synchronized Skating Sectional Championships by storm in Worcester, MA, on Feb. 2, capturing championship titles in five divisions. All Skyliners qualifying lines ended up on the podium, with Novice and Juvenile earning gold and Intermediate capturing silver. 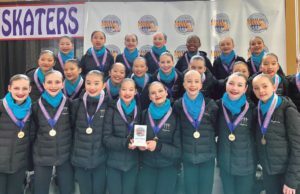 In the three non-qualifying divisions they entered, Skyliners took all three—Preliminary, Pre-Juvenile and Open Juvenile Championships. 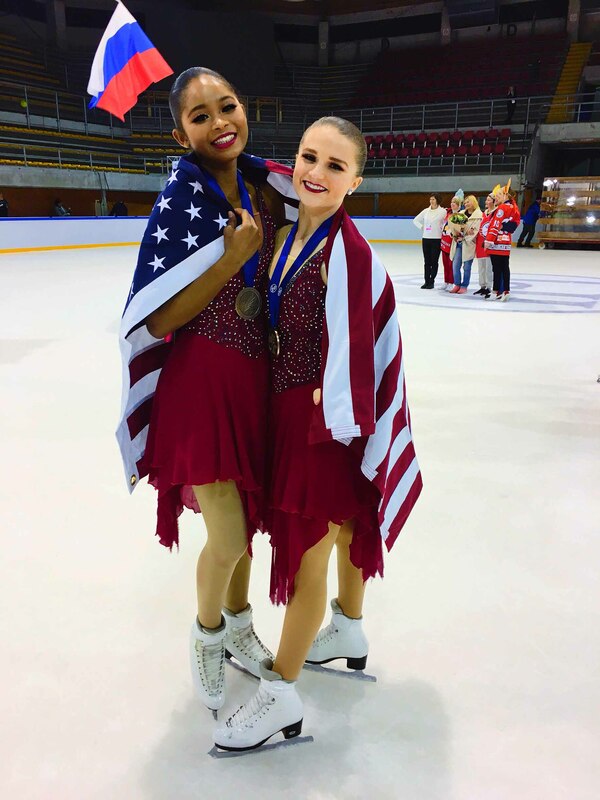 Amie Adjakple (left) celebrates her Bronze win in Neuchatel, Switzerland, with her teammate. Great Neck girls achieved incredible success at the Easterns. On the Juvenile line, Feng and Wong won the gold medal in the qualifying line. On the Junior line, Adjakple earned a “bye” to nationals as part of Team USA. On the Preliminary line, Victoria Tjihaja won the gold medal in the non-qualifying line. “We are so proud that each of our lines performed at the top of their game at Easterns and that all of our qualifying lines earned a place at the 2019 national championships,” said Babb. Of the more than 2,100 synchronized skaters who competed at Easterns, the Skyliners sent nine lines with 170 skaters ranging in age from 8 to18. Skyliners Team USA 1, the 2019 U.S. National Champions in Synchronized Skating, become the second consecutive World Junior Synchronized Skating medalists, with Adjapkle and Wang (top row, center) and Politoski (bottom row, right). 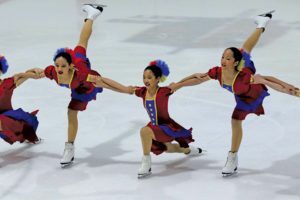 Being on a synchronized ice skating team can be a bonding experience for figure skaters who perform together as a team.